At Supreme Window & Glass, we can help you select replacement windows based on what is most important to you in a window solution. We carry multiple lines of replacement windows to enhance the exterior design of your home, some also emulate the beauty of traditional wood windows without the care and maintenance. Our line of replacement windows combine high performance, security and energy-efficiency features, as well as its highly coveted custom design options. Replacement windows from Supreme Window & Glass can reduce energy bills, increase peace of mind and provide an excellent return on your investment. Double hung replacement windows are probably the most common window found in homes today. These windows are desirable because both sashes open for ventilation and tilt-in for easy cleaning. Slider windows are designed with elegance, grace, and functional ease. Slider windows are available in two and three lite styles, and complete with four durable brass rollers for ease of operation and feature heavy-duty sash locks for added security. For unobstructed views where ventilation is not a concern, picture windows are an ideal choice.They maximize views, as well as bring in the most available light. Picture windows are appropriate for any home style, from traditional to modern. They create a portrait-like space on walls—hence the word “picture” in their name. Picture windows turn your view into a living painting and, when large enough, make the outdoors feel like another room. Need to combine view and ventilation? 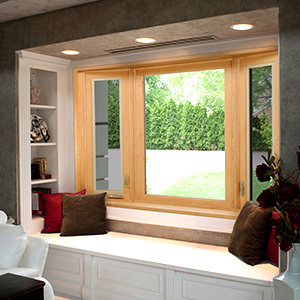 We can customize picture windows with one or more operating windows. Bring sunshine, outdoor views and a greenhouse space into your home. With a garden window, you can add a window greenhouse to almost any room. Garden windows extend out from the house and generally have an interior shelf for plants and herbs. Side vents provide ventilation. A bay window is a combination of three or more windows that dramatically extend from your home. Very similar to bow windows, bay windows make a perfect addition to a living room or master bedroom. They also bring in more light and give a feeling of spaciousness to a room. Bay windows can be used in many different architectural settings and can be flanked with casement or single hung windows for ventilation and additional light.